A woman in Houston has given birth to sextuplets in under 10 minutes. So what lies ahead when she brings her six newborns home? 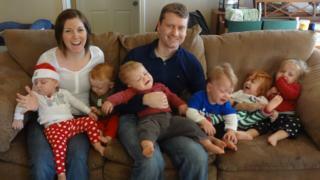 They say it takes a village to raise a child, however, they don't say what it takes to raise sextuplets. While becoming a parent can be a scary and worrying time for anyone, what is it like to raise six babies all at once? We spoke to two families raising children born in multiple births to find out. Lauren Perkins said she was in "complete shock" and "overwhelmed" when she found out that she would be giving birth to sextuplets. "I knew we needed a support system, because there was no way we were going to pull this off by ourselves," she told the BBC. Luckily for Lauren, her community stepped in after her family grew by six overnight. "We would not have survived the first year without them," she says. The Perkins sextuplets came home from the hospital one at a time, which Lauren says helped her adjust. "The sixth baby to come home was Leah, who has previous developmental problems, and that was a bit overwhelming." With six babies to feed, bathe and clothe, Lauren developed a tight schedule. "I would make up bottles each night for the next 24 hours and set them in the fridge with labels on so everyone knew which baby they were for and at what time." Because of the different nutritional needs of the sextuplets, the family were using four different types of formula milk at one point. She also developed a shift system so that those volunteering to help could have the biggest impact. "Friends would sign up to come and do feeding shifts in the middle of the night, they would help with giving the babies baths and doing laundry. "We wouldn't have made it without that generosity," Lauren reflects. "They brought us dinner for an entire year!" There are many factors that lead to multiple pregnancy, including a family history of twins, falling pregnant over the age of thirty, or having previous pregnancies. African-American women are more likely to have twins than any other group, while white women, especially those over age of 35, are most likely to give birth to triplets or more. Reproductive technologies have greatly increased the multiple birth rate in recent years. In vitro fertilization (IVF) and other techniques that help couples conceive often use ovulation-stimulating medications to produce multiple eggs. These are then fertilised in the laboratory and returned to the uterus to develop. According to the Centres of Disease Control and prevention "more than three-quarters of triplets and higher order multiples in the United States resulted from conception assisted by fertility treatments". The number of women giving birth to multiples in the US rose 76% from 1980 to 2009, but still only accounts for 3.5% of all births. In 2017, there were only 31 babies born in the US as part of quintuplets or a higher-order multiple. Like twins, other multiples can be identical (where one egg splits into two or more embryos), or fraternal (when more than one egg is fertilised). Medical complications become increasingly likely with each additional foetus in a multiple pregnancy, and can result in serious health problems. While the Perkins' loved ones donated their time, many also donated essential supplies. Lauren says that her family went through "astronomically expensive" formula milk at a rapid rate, and relied heavily on second-hand clothes. "Several friends threw baby showers and we always asked for diapers. Every birthday, we asked for diapers and clothes for the babies." In the end, Lauren didn't have to buy nappies for the first two years, after making a concerted effort to limit the number of changes. As the children grew, the challenges changed. "Potty training was a complete nightmare," Lauren remembers. "There are just so many to keep an eye on, and you have to watch them so closely when potty training. There were a few accidents, but we did it in the end!" Lauren explains that as the sextuplets became more independent, her support system dwindled. "As they grew up, logistics got easier. It has become a sort of controlled chaos. It's noisy, a lot of people and stuff, but it's this weird system that just works." The Perkins sextuplets are almost aged seven now, and Lauren says she goes through the "normal phases of parenthood" like anyone else. "It's just different because I do everything at once, which makes me glad and sad. "I know I have to soak in all the cute kids stuff as much as possible because I'm not doing it again. I'll never get a first walk or first day at school again. It's just parenthood concentrated." Amy and Chad Kempel waited until after their quintuplets were born to throw a baby shower or paint the nursery. The couple had previously lost twins through miscarriage and didn't feel able to prepare in the same way. "It was devastating, and it was a long road to having the quintuplets," Chad says. However, last year they brought home five healthy babies. "What are we going to do now?" Amy asked herself. One of the first hurdles was feeding. "To cut down on the amount of time we spent feeding we decided to feed them all at the same time, all at once," Chad says. Using a number of pillows, careful balancing and dexterity, the couple developed a system to bottle feed all five children simultaneously. The quintuplets all sleep in the same room and began sleeping through the night at six months. "When they get a bit older and can keep each other awake, that might change," Amy says. The Kempels have two older daughters, but Amy notes the experience of raising five premature babies simultaneously was "very different". "Initially bonding was very difficult for me," Amy says. "They were in the hospital for a long time, and in incubators. "Not being able to hold them and take them home was hard." Chad and Amy say that they had braced themselves for the babies to have "major health issues or disabilities". However, after the initial medical intervention, Amy says the first year of the babies' lives has been "uneventful in a good way". While being at times "very challenging", the couple conclude things are "going well".